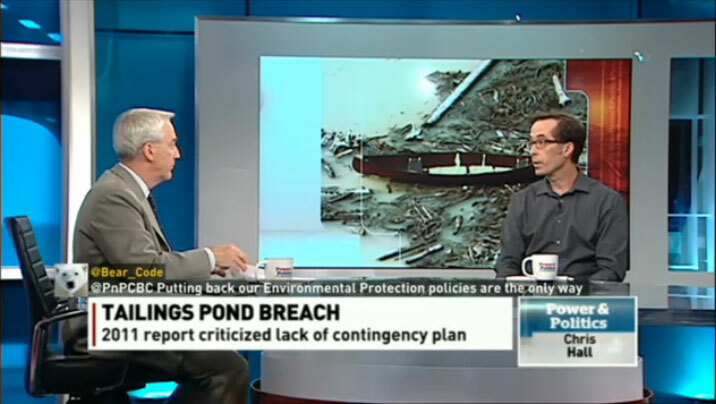 Former Canada Program Coordinator Ramsey Hart on CBC’s Power & Politics, one of many national news programs to interview him about the disaster. The last few months have been pretty eventful. August saw the biggest mine spill in Canadian history at the Mount Polley mine in B.C. No-one was killed, thankfully, but the effects on the Lake Quesnel ecosystem (and especially the salmon) and the people that depend on it could be serious, and will not be fully known for years. We are pressuring the federal and provincial governments to make sure this cannot happen again: they need to fix regulatory and monitoring systems, and give affected communities a meaningful say in development. No longer can they or industry dismiss concerns by claiming that such disasters can’t happen anymore, or that mining is well controlled, engineered, and regulated. More recently, details emerged of how lax regulation by governments also allows mining companies to avoid posting closure and clean-up bonds that are anything near adequate. For decades, governments and industry have assured us that abandoned mines requiring massive public spending on clean-ups (like the billion dollar clean-up of Yellowknife’s Giant Mine) are a thing of the past. We are told that mines are now planned for closure from before they start operating, and that financial assurances will make money available to the responsible jurisdiction to do the clean up should the company go bankrupt or walk away from its responsibilities. Well, it’s not quite so. Will the Supreme Court of Canada Allow Ecuadorans to Ask Canadian Courts to Enforce Ecuadoran Court Order? Once again we are going to the Supreme Court of Canada, this time as an intervenor in Ecuadoran villagers’ case against Chevron. They have been trying to get Chevron to pay the $9.5 billion judgement against the company, and this year, the Ontario Court of Appeal ruled that complainants could seek enforcement in this country. Chevron has appealed that ruling to the Supreme Court of Canada. It’s being heard on December 11. We’re not taking on Chevron, but we are very interested in establishing a precedent that communities anywhere in the world who have been harmed by transnational corporations can attempt to enforce a judgment elsewhere against another branch of the company here. We’re represented by the small but stellar Toronto law firm Klippensteins, together with the International Human Rights Program at the University of Toronto Faculty of Law (IHRP) and the Canadian Centre for International Justice (CCIJ). The Inter American Human Rights Commission – an independent office of the Organization of American States – has added its voice to a growing list of human rights bodies calling on Canada to prevent mining abuses and hold Canadian companies and state agencies responsible to account. In our own presentation to the Commission on October 28th, we highlighted how the Canadian state itself is implicated in grave Indigenous and human rights violations through its own acts and omissions, given the myriad of ways that it aggressively promotes and protects mining company interests from Mexico to Argentina, in the most deadly of circumstances and in the face of determined community resistance. In October, the CEO of Tahoe Resources, mining big shot Kevin McArthur (formerly of Goldcorp) was called to testify before an investigation into his company’s treatment of community opposition to its operations in Guatemala. The fact that he didn’t bother showing up says a lot. Meanwhile, the lawsuit filed in June against Tahoe Resources by seven Guatemalan men – for negligence and battery in connection with a shooting outside the mine in April 2013 during which they were wounded – will likely be heard in 2015. We worked with Guatemalan activists, the Guatemalan Centre for Legal, Environmental and Social Action (CALAS), and the Justice and Corporate Accountability Project at Osgoode Hall Law School to lay the groundwork for the case, allowing the Canadian Centre for International Justice (CCIJ) and Vancouver law firm Camp Fiorante Matthews Mogermanto to work with local groups, the latter taking the case pro bono, advised by CCIJ and CALAS. In August, Catherine Coumans was invited to travel to Marinduque Island in the Philippines to meet with civil society organizations, municipal elected officials, and the elected Provincial Board. The topic on people’s minds was a long-running lawsuit pitting the Provincial Board against Canadian mining giant Barrick Gold. The case, filed in the state of Nevada in 2005, is at a crossroads and it may be re-filed in Canada. Marinduqueños sought Catherine’s assistance in considering their options. We’ve reported before on horrendous abuses at Barrick Gold’s mines in Papua New Guinea and Tanzania: assaults and shootings leading to severe injuries and deaths of both men and women, and rapes and gang rapes of women. With UK organization Rights and Accountability in Development (RAID), this past summer we documented over 30 testimonies from victims and their families in Tanzania, and met with local medical professionals who treat the injured, local NGOs who provide support, human rights defenders, and mine personnel. This fieldwork provides further evidence of the way in which Barrick’s response actually exacerbates the original abuse, offering “benefits packages” in return for victims signing away their right to take the company to court. Catherine also made a presentation on this issue at the UN Forum on Business and Human Rights in Geneva in early December. In July, Environment Minister Leona Aglukkaq bent to the desire of BC to go it alone on the environmental assessment of another major resource development project – in this case, the proposed Ruddock Creek lead/zinc mine northeast of Kamloops. While most of our environmental legislation gives considerable discretionary authority to the Minister, the new Canadian Environmental Assessment Act (CEAA 2012) is strict on substitution: it includes an “obligation” that the Minister must accept a substitution request if a province meets certain general criteria. (Section 32) A case can be made for failure to satisfy the criteria but the current federal government is more than happy to concede, despite significant concern from the public, experts, and First Nations that the provincial process doesn’t even meet the standards of the new, greatly diminished – sorry, “strengthened and modernized” – federal one. There was no doubt that the Canada-Honduras Free Trade Agreement would be rushed through the Senate and receive Royal Assent before parliament recessed in June. Five years ago, however, – before then-Honduran President Mel Zelaya’s back door was shot open and he was flown to Costa Rica in his pyjamas in a military-backed coup – such a trade pact was not so sure. Today, thanks to Canadian lobbying efforts and financial support from 2010 to 2013, Honduras also has a new mining law that has lifted a nine-year moratorium on new mining activity and unleashed a wave of violent repression for which communities are paying a high price. On June 26, the Supreme Court of Canada released a much-anticipated decision in the Tsilhqot’in case. The core issue in the case was the extent and nature of Aboriginal title – collective ownership – over a traditional territory; the Court affirmed Tsilhqot’in title to a broad area of land that included areas of seasonal and rotational uses for hunting, fishing, and gathering, and provided added clarification on the meaning of Aboriginal title. From May 31st to June 1st, an expert tribunal gathered in Montreal for the first ever Permanent Peoples’ Tribunal (PPT) in Canada. The PPT is an international initiative established in 1979 to give visibility to underreported human rights violations “where national and international justice systems are found to be incapable of ensuring that rights are respected.” Five Canadian mining companies, including Tahoe Resources, were among the accused at this ethical tribunal, along with the Canadian government given its extensive promotion and protection of the Canadian mining industry abroad. The Tribunal found the Canadian state guilty, by act and by omission, for its role in human rights violations in Latin America as a result of its efforts to spur, sponsor, and protect Canadian mining investments abroad – along with five Canadian mining companies. Some forty organizations from Quebec and Canada supported the Tribunal’s session on Canadian mining in Latin America, including MiningWatch Canada. The Tribunal’s final verdict will be presented on December 10.